Hex wrenches in The Division 2 are items that you can find. Division 2 hex wrenches appear in the Trinkets section of your inventory, and you might need them to complete some Settlement projects. The trouble is that these items apparently drop extremely rarely. 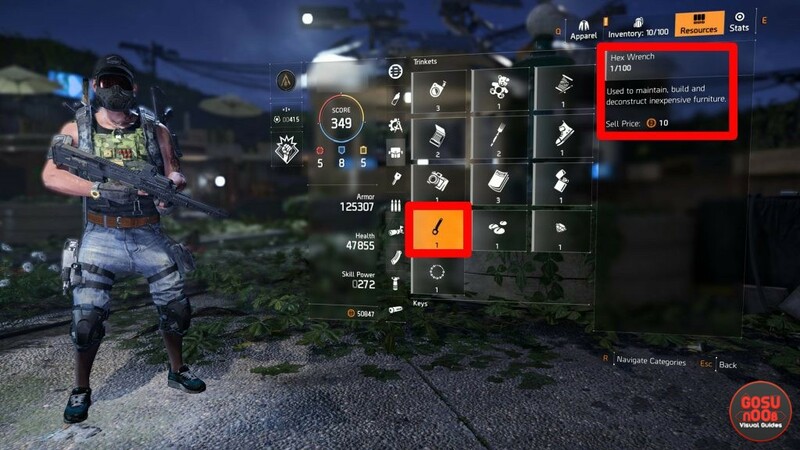 This being the case, our Division 2 Hex Wrench Farming Location – How to Get guide is going to show you where to can farm hex wrenches in order to complete the projects the game gives you. Where to Find Hex Wrenches in Division 2? To find the Hex Wrenches in The Division 2, in order to complete some of the projects for the different Settlements, there is one specific location where you can farm. At least, until they potentially patch it out. Having a farm point for The Division 2 hex wrenches, considering how incredibly rare the item drops. First off, fast travel to the Safe House called The Shop. It’s near the Lincoln Memorial mission, in West Potomac Park. You’ll be underground. Look for the long staircase leading to the East Exit, and climb up. Ascend the second long staircase, and you’ll be facing the door leading outside. However, you don’t want to exit just yet. Instead, turn to your left, and you’ll spot a mannequin in the center. Walk past the mannequin, and look behind the counter. You’ll spot a small, gray, filing cabinet. Loot it, and see if you get a hex wrench. Now, whether you get a hex wrench from there or not, it doesn’t matter. All you have to do to get more hex wrenches, or try again to do it, is to log out of the game, then log back in. Once you do that, you can try and open the same filing cabinet again. It’s basically re-rolling the dice, and see what happens. One more thing we have to bring up is something that Reddit user Keyshack100 brought up. They say that they only got hex wrenches once they abandoned the task that required them. So, there might be some kind of bug there that you’d have to pay attention to.